Quality Assurance or QA for short. 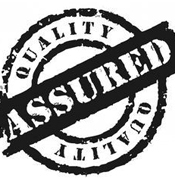 Yes, we do monitor and evaluate strictly all the aspects of our projects in order to secure the minimum standard required. We are trying to guarantee the whole production. We work based on principle "Right First Time" - mistakes should be eliminated from the start.